Click here for our comprehensive guide with team info, images and more. 2013 Upper Deck Football gives collectors their first chance to catch the 2013 NFL Draft class in their college uniforms. The set comes with several familiar elements from the company's past that have been given a new spin. Hobby boxes promise three autographs and several other inserts. 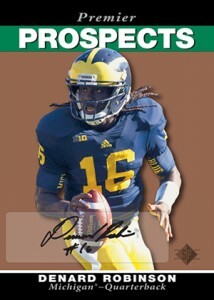 The 2013 Upper Deck Football base set has 250 cards: 50 regular cards and 200 Star Rookies. While the Star Rookies dominate the checklist, they're also plentiful, falling two or three per pack. 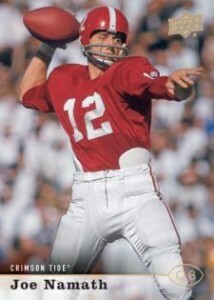 The checklist includes such NFL prospects as Geno Smith, Matt Barkley, Mike Glennon, Eddie Lacy and Manti Te'o. Ink leads the chase, with a trio in every hobby box. 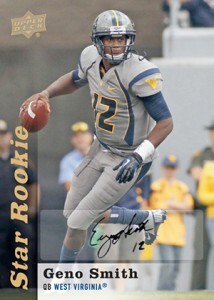 Most come from other parts of the set, such as Star Rookie Autograph parallels. 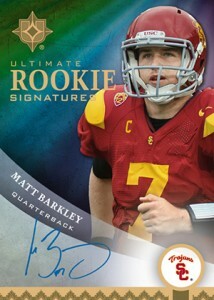 One standalone autograph set is Rookie Lettermen Signatures. All are numbered. 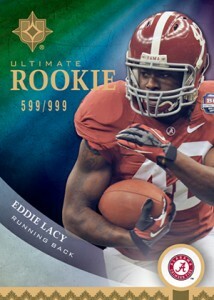 Ultimate Rookies return, keeping the former standalone brand fresh in collectors' minds. Numbered to 599, two are in every box. The Ultimate Rookies checklist has 60 cards, 21 of which have also signed additional cards. 2013 Upper Deck Football heads back to the 1990s with 1995 SP Football and1995 SP Prospects cards. Together, they fall four per box. Collectors can also look for signed parallels. The Heroes line has a long history in the hobby, dating back to one of the company's first sets. 2013 Upper Deck Football has a pair of College Football Heroes sets dedicated to two of the game's all-time greats: Joe Namath and Barry Sanders. Both players have two Heroes inserts in every hobby box along with random autographs. Continuing from last year are the College Mascot Patch cards. Inserted 1:40 packs, another 60 cards have been added to the set, which continues from where the first series left off. Each has a manufactured patch. Tiered rarities mean some of the cards are harder to find than others. Don’t worry guys the CLC exclusive that Upper Deck currently has will be gone soon. Mash and Cash know this and are very worried. Upper Deck has been slow to pay but always does at the last minute which won’t bode well when the deal comes up next year. This product while it looks good will be crashing soon as the good autos never come out. Collecting for me, is a nice and quiet hobby that creates a Zen like quality for me. It should not be a stressful hobby. I see many collectors complain and stress about these early products; “That they lack the permits needed to be a NCAA certified card producer”! Or that they do not have the permission to print NFL related logos hence making them cheap. I feel that the 2013 Upper Deck product is far from cheap. Printing done on great card stock and photos that have made Upper Deck a favorite among collectors of past are worth a thousand words! I really love the ’95 SP inserts. And if you can find hanger packs at your local Walmart, they gaurantee 2 special retail exclusive RGIII cards. This is a win, win, and win product. I absolutely love the product. It’s so much better than last year. Thus far I’ve only bought the retail hang packs and bought eight more tonight and pulled both the Denard Robinson and Collin Klein retail exclusive variations and also a Jelani Jenkins variation. Are the top player autographs tough to get? Sure. THAT’S WHAT MAKES A GREAT PRODUCT! It’s not watered down. I also like that SPs and SSPs aren’t serial numbered. It’s more like the “old days.” Someone stated you don’t know “if cards are rare.” Well, that Robinson I pulled, there’s not been on on feeBay yet that I can find, so it seems pretty damn rare to me. I am a college football guy (barely watch the NFL) and this is the set where I can get rookies of players in full college unis. I LOVE it! I don’t understand the haters, this is almost like Topps Heritage Baseball, which I’ve loved for years. Nice looking card printed on nice stock. Unfortunately, there just aren’t that many great players in this year’s class. Can someone please tell me how the heck I’m supposed to know if I pull a photo variation card?? I can’t find pics anywhere on the net, yet I hear you guys talking about how you’ve pulled them?? Brandon � Photo variations in this also have different numbers — like a separate card altogether. Our checklist lists them all. Still alot of cards from this set not pulled and its August 3rd – what happens to unsold products like this ??? michael � It’s only been out for a couple of months. After a year you may find some closeouts if there’s still some left over. 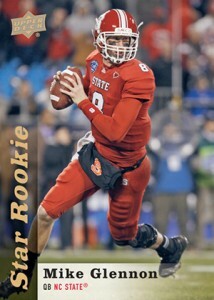 My Rookie Letterman card is only #’d to 50! Could someone clarify this for me? Matt F � Likely that the higher print runs reflect the total number of all letters combined. Any chance you can get a checklist of the redemption autograph set? Its not the same as the star rookies autograph set. For example, McGloin doesn’t have a regular autograph but hes in the redemption set. Zach � Your best bet would be to compare with similar parts of the product that might have odds and serial numbers. Whichever the case, it’s safe to say what you have is probably pretty rare. Hey Ryan, thank you for the quick response and feedback. I will start comparing what looks closest to the Geno I mentioned. Thanks again. I really appreciate it.